Turkey, which last week called for an extradition of US-based Turkish cleric Fethullah Gulen (blamed by the Erdogan government for the failed 2016 military coup) in exchange for the release of US Pastor Mr. Andrew Brunson (whom US President Mr. Donald Trump wants to see released) has softened its demand somewhat, now linking the fate of a Turkish bank on which the US has imposed sanctions (Halkbank, a majority state-owned bank) to the release of Mr. Brunson. The White House administration however flatly refused and said there would be ‘no concession’ to Turkey for Mr. Brunson’s release. Related coverage: <a href="https://thegoldwater.com/news/34203-Pastor-Andrew-Brunson-Turks-Smash-iPhones-Pour-Coca-Cola-In-Toilets-Video">Turks smash iPhones, pour Coca-cola in toilets (Video)</a>. 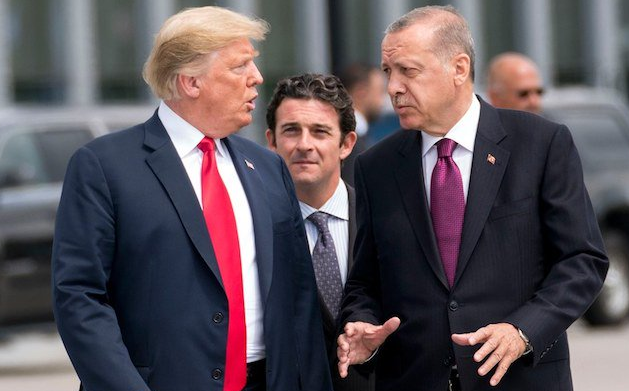 Unlike the previous US government who made deals with Middle Eastern nations (Iran) in order to get a result, Mr. Trump has stated he would not back down in his standoff with Turkey. Mr. Trump, in an interview with Reuters over the Turkish standoff, claimed: "I think it's very sad what Turkey is doing." There were press rumors in the past few months that Mr. Trump and Mr. Erdogan met in Brussels for a NATO summit in mid-July and discussed the possible release of Mr. Brunson at that point already. At that moment, Turkey sought US help to persuade the Israelis to release a Turkish woman who was being held in Israel. In exchange, Turkey would release Brunson and other Americans being held in Turkey. The story goes that the US kept their end of the bargain and called Israeli Prime Minister Benjamin Netanyahu. .
Related coverage: <a href="http://thegoldwater.com/news/34542-Germany-Ruling-Leftwing-Party-Wants-To-Aid-Turkey-In-US-Standoff-Over-Pastor-Brunson">Germany ruling party wants to aid Turkey in US standoff</a>. The White House administration imposed tariffs on imports of Turkish steel and aluminum in response to President Recep Tayyip Erdogan's refusal to free Mr. Brunson. The Turkish lira has fallen to new lows since, creating an economic crisis in the region.